Peglooms for hand weaving. For individual looms please see sub-sections. "If you can get it into a strip you can weave it on a pegloom"
POSTAGE: Due to Royal Mail length restrictions our 75 cm and 1 metre peglooms are only available using the MyHermes carrier option at checkout regardless of the option selected. Will be sent to the UK only. Native British beech, much stronger than standard hardwood dowel. Stronger but less ‘green’ than beech. 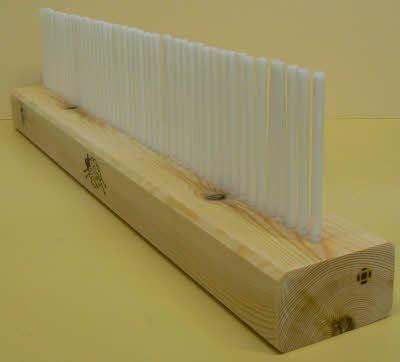 the gap between the pegs is the thickness of material to use. 4mm: Scarves and 'picture' hangings from single strands of yarn. 6mm: Bags and rugs from commercial rug wool, spun yarn, several strands of wool etc. 8mm: The best general purpose loom for rugs using raw fleece, strips of cloth etc. 10mm:For chunky rugs using fleece, plastic bags etc. 12mm: For super-chunky rugs using raw fleece. All come with instructions, a threader and spare peg(s). Please note that the photographs in this section, except some quarter meters, do not show the entire width of the looms as the picture display width is insufficient.